The Non-Coded Heart Rate Transmitter monitors and then wirelessly transmits your heart rate data from the chest strap to a compatible receiver. This allows the wearer to monitor their heart rate and related bio-metric statistics. 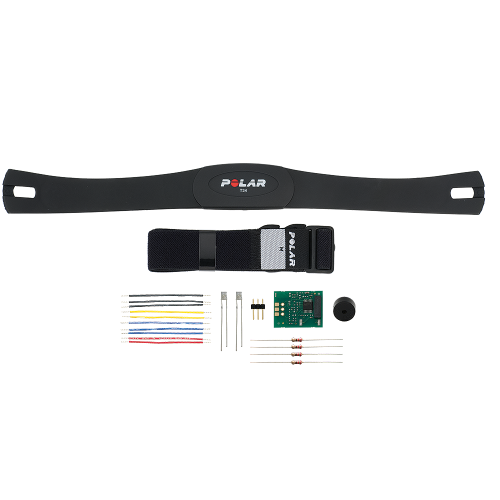 The Heart Rate Receiver is a receiver capable of wirelessly receiving coded heart beat transmissions from the Heart Rate Sensor. With its standard servo interface pinout (Vss, Vdd, Sig), interfacing with this receiver is very simple - upon receipt of a heart beat signal, a 15 ms pulse is sent on the signal pin. This receiver also features a longer reception distance, giving you added flexibility in your application.